A run in the bottom of the seventh inning lifted Clinton to a 7-6 Region 3-3A softball victory over Mid-Carolina at CHS on Friday night. Katelyn Baker singled on an 0-2 pitch, driving home the walk-off run. Each team had nine hits. The Red Devils committed the only error. Clinton led 4-1 until the Rebels scored five runs in the fifth inning. Clinton tied the score with two runs in the sixth. Kamryn Akins went the distance in the circle, walking oly two and striking out nine. She also drove in the tying run on a single in the sixth. All nine of Clinton’s hits were singles. Only Savanna Campbell had two. Beth Wiggins and Baker each drove in two. Red Devil batters struck out only twice in the game. Greenville – specifically, J.L. Mann High School – was an unkind locale for Laurens, which dropped a 14-4 decision to the Patriots. Mann led by only a run, 4-3, until scoring eight runs in the fourth inning. Kennedy Wright, Caroline Clark and Ash Alte opened the inning with consecutive singles. The Raiders committed four errors in the inning. Four Mann batters – Alte, Kinslee Hughes, Tia Beckham and Wright – each had two hits. Hughes ripped both a double and a triple. Hughes and Beckham each scored three runs. 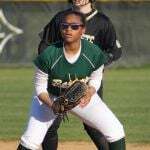 Michaela Smith and Kauree Munyan led LDHS with two hits apiece. Munyan and Bre Posey hit doubles. Mac Ellis was the winning pitcher. Rachel Delio took the loss. The Clinton boys’ soccer team took a 2-0 loss to Mid-Carolina in Prosperity. Clinton (7-8, 4-5 Region 3-3A) played without Cameron Nichols, injured against Woodruff the night before, and Luke Mann played sparingly. The Red Devils will apparently make the playoffs as the region’s our seed and have a week to prepare. The Red Devils’ baseball team scored five runs in the top of the seventh inning, but fell short, 8-7, at Mid-Carolina.